Mar. 29 (NBD) -- A 27-story wooden structure without any iron nail, Sanjiang Drum Tower stands silently by the Xunjiang River, watching over the county inhabited by Dong minorities as well as the cultural legacy of Dong people - Dong Embroidery. Tan Guizhen, a certified inheritor of Dong embroidery, runs a workshop in Sanjiang Dong Autonomous County. After graduating from a university and working temporarily, the post-90s girl decided to return to her hometown and take up the traditional folk art. Dong embroidery, listed as a national intangible cultural heritage in 2011, is an important part of Dong people's culture. A national-level poverty-stricken county, Sanjiang is a mountainous region traditionally inhabited by Dong people, bordering the prefecture-level divisions of Qiandongnan (Guizhou) to the north, Huaihua (Hunan) to the northeast and Guilin to the west. While more and more young villagers are leaving the county for decent salaries in the cities, Tan walked away from bustling urban life and plunged into lonesome embroidering. 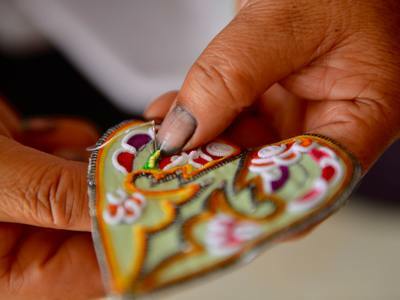 "One day, my mom said to me bitterly, 'when I am too old to embroider, I'll feel sorry if no one learns the skills from me and passes on the craft'," Tan recalled the moment when she started thinking about coming in for the embroidering art. Since childhood, Tan learned the exquisite handicraft from her mother Wei Qinghua, who is also an certified inheritor of the precious art. Wanting to assist her mother, in 2017, Tan became a full-time embroider, not an occupation her father wished for. "A rural woman, my mom knows well about embroidery but nothing about computers. When she is to teach others how to do embroidery, I will make slideshows for her." Stitch-work completed jointly by Tan and her mother has won several awards. The traditional craft used to be a must for Dong girls back then. But as the mass production era came, Dong embroidery has gone far gradually from daily life of Dong people. In an attempt to revitalize the tradition and to invite people to rediscover the beauty of the delicate heritage, Tan and her mother started to apply embroidery to new items such as sofa cushion and painting frames and employ new patterns including twelve Chinese zodiac signs. Tan's family use paper cutting to prepare the patterns for embroidering. Tan's grandmother Yao Peiqian (also known as Tan Naishiqing), also a master of Dong embroidery in Sanjiang, started learning how to cut paper patterns at the age of 7. Despite the senior age, 92-year-old Yao, with her steady and clever fingers, can cut paper patterns without actually drawing them, a tiger, a rabbit, a spider flower and so on. In addition to the artistry inheritance within the household, Tan's family is also getting embroiders in the neighborhood involved to preserve the traditional craft together. Orders that Tan's workshop obtains are distributed to close-by weavers. 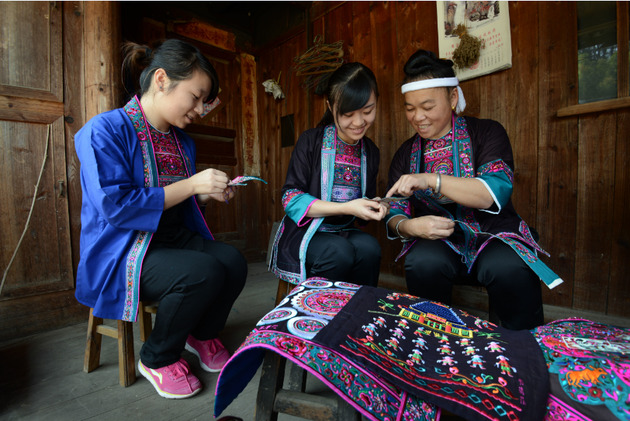 The workshop "Qinghua", which is named after Tan's mother, displays traditional weaving machine, dye vat, paper cuttings, embroidery pieces, clothes, and shoes, etc., presenting the embroidery art of Dong ethnic group. From Yao Peiqian, to Wei Qinghua and to Tan Guizhen, the traditional folk art has been preserved and passed down in the family for over 100 years.